There is nothing quite like freshly-made pizza, especially when you are preparing it at home and creating it just how you like it. Many people will make the base from scratch, using their favourite dough recipe, but then top it with a simple tomato pizza topping out of a jar. But if you’re conscious about what is in sauce, or are looking to cut out sugar/salt, then they aren’t ideal (not to mention not as tasty). 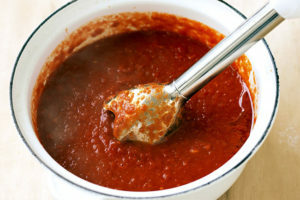 You may also find ordinary tomato-based sauces are unnecessarily sweet. 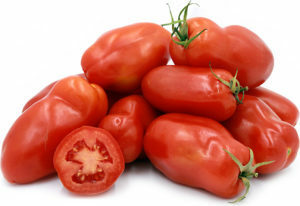 Sugar is usually added to them to counteract the tanginess of the tomato but is really not needed. It tastes so much better when you make an effort to prepare it yourself – trust us. It is fresh, tangy and takes minutes. This recipe makes enough sauce for about 8 pizzas, but if this is too much, you can refrigerate for up to a week or freeze in a suitable container for three months and thaw overnight before using. If you prefer a completely smooth or tangier taste, the ingredients can be added to a food blender rather than combined in a bowl. Just drain the tomatoes first, so the sauce isn’t too watery. There is no need to simmer it after this – it can simply be served as is. The San Marzano tomatoes are used to create a thicker sauce, but any canned version are good.